Finding the perfectly-sized women's motorcycle boots should not be hard. With our collection of riding boots for women you can find not just a great fit but style and comfort as well. Long gone are the days of a tight fitting boot that doesn't breathe, today's ladies motorcycle boots look just as good on the bike as they do off and you just might find they work just as well off the bike as they do while riding. We carry all the best women's motorcycle boots from the industry's leading manufacturers. Each product page offers a size chart so you know exactly what size to order and what you see on screen is what you get at your door. You can shop for women's motorcycle boots with confidence because if you don't like them after opening the box or they just don't fit right, we'll gladly exchange them or refund your money. 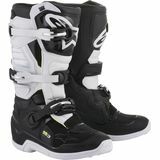 MotoSport stocks all the best motorcycle boots for ladies so check out our entire selection and if you're loyal to one company click on the link under "Brand" to narrow you choices.